On April 18, 1942 a group of 16 B-25s carrying 80 men emerged from the Pacific sky to launch an historic attack on the central island of the Japanese empire proclaiming with unexpected force that war was coming to the Japanese homeland. Lt. Richard O. Joyce and the crew of Plane 10 (#40-2250) engaged and eluded as many as seventeen Japanese fighter aircraft throughout their mission. S/Sgt. Edwin W. Horton's twin-50s in the top turret played a crucial role in keeping the enemy at bay as Lt. Joyce piloted the B-25 across the hostile skies of Japan and on to China. Sixty-nine years later, only five of the original 80 airmen that flew on the Doolittle Raid on Japan remain. Just enough to man a single B-25, one last crew. Time has been kind and granted you the opportunity to own an authentic piece of Doolittle Raider history but that door is closing. The print and canvas editions of "Engaging the Enemy" was signed by the actual Raiders attending their 69th reunion. 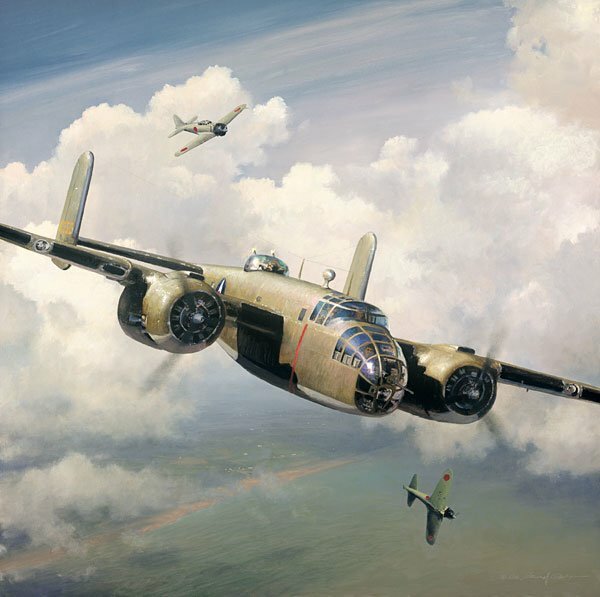 "Engaging the Enemy" was painted specifically for the 69th Omaha reunion, home to pilot Richard O. Joyce. The fine art canvas is an exact replica of William S. Phillips’ original 24” x 24” painting. Only by spending tens of thousands dollars for the original could you possess something better. The edition is limited to just 50 copies, so only a few will have the chance to own one.